^ N. Subramanian (September 21, 2005). "Remains of ancient temple found". The Hindu. Archived from the original on November 10, 2012. ^ N. Ramya (August 1, 2010). "New finds of old temples enthuse archaeologists". Times of India. 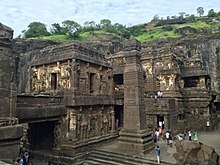 ^ Over 125 temples exist in Aihole alone, Michael D. Gunther, 2002. "Monuments of India". Retrieved 2006-11-10. ^ Takeo Kamiya. "Architecture of the Indian Subcontinent, 20 September 1996". Gerard da Cunha-Architecture Autonomous, Bardez, Goa, India. Retrieved 2006-11-10. ^ Kannikeswaran. "Temples of Karnataka, Kalyani Chalukyan temples". [email protected],1996–2006. Retrieved 2006-12-16. ^ Adam Hardy. "Indian Temple Architecture: Form and Transformation-The Karnata Dravida Tradition 7th to 13th Centuries, 1995". Vedams Books from India, Vedams eBooks (P) Ltd. Retrieved 2006-11-17.